Our fleet of dedicated bulk drinking water tankers can deliver up to 10,000, 15,000, 19,000 and 30,000 litres per load and provide water transport solutions for any situation or emergency. Where access for large vehicles is an issue, we can also deliver smaller volumes of water using our 2,000 litre towable bowsers, towed via 4×4. Our 10,000, 15,000 and 19,000 litre rigid water tankers are compact and manoeuvrable, offering cost effective, medium volume deliveries. Large enough to make bulk deliveries in a single visit, yet small enough to access residential areas, rigid tankers are ideally suited for filling multiple static water tanks or delivering to busy, congested festival and construction sites. 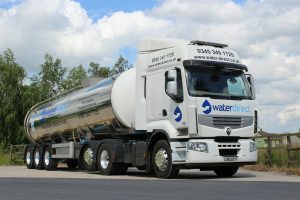 30,000 litre articulated vehicles are ideal for supplying larger volumes of water. At approximately 15m in length however they are not suitable for sites with access or weight restrictions; in this case rigid tankers can deliver multiple loads to meet larger demand. 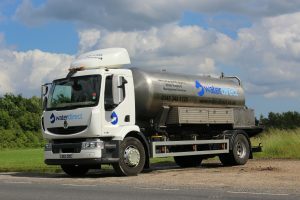 All tankers are equipped with variable speed hygienic stainless steel pumps and pipe work capable of delivering up to 920 litres per minute / 7 bar pressure. This means rigid tankers can discharge in less than 30 minutes and articulated tankers in less than 45 minutes (please see technical specifications below for further information). For detailed information on our fleet of water tankers, please download our PDF technical specifications.